Here's a little bit of information on some of Nails Inc.'s upcoming Holiday items. I'm excited about all this glitter. And flaky topcoat/vampy creme duos? Already ordered one, didn't even hesitate. 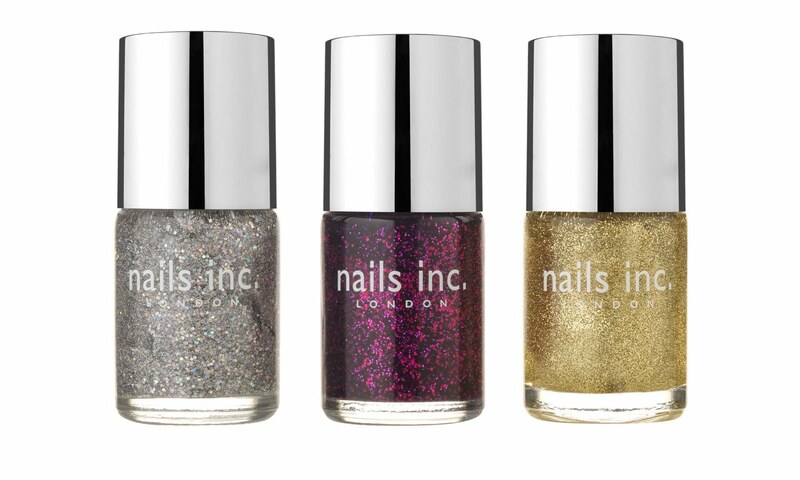 Four mini metallic shimmer polishes to see you through the holiday season! The unique metallic shimmer finish will complement any outfit. 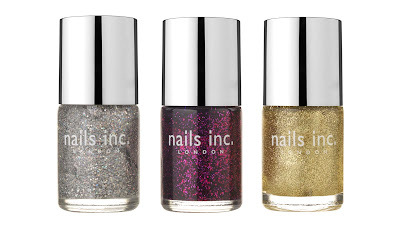 Three full size glitter polishes perfect for a show stopping party look. These glitter shades have fantastic coverage and will make your nails sparkle! 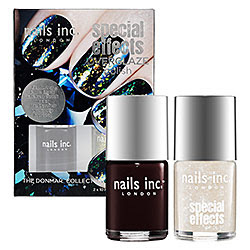 What it is: A duo of stunning theatrical-effect nail polishes. What it does: This pair of gorgeous nail polishes is sure to bring out your creative handiwork. The Donmar Overglaze top coat contains hand cut, irregular particles in red and green to create dramatic holographic effects when applied over other polishes. Designed to work perfectly atop Chelsea plum black polish, it's also beautiful over other shades such as Tate classic red polish or Lanesborough Place gold polish. What it does: This pair of gorgeous nail polishes is sure to bring out your creative handiwork. The set features Wyndham Overglaze top coat, which contains hand cut, irregular particles to create dramatic holographic effects when applied over other polishes. Designed to work perfectly atop Kensington teal black polish, it's also beautiful over other shades such as bright white Floral Street or The Thames cool gray polish. It includes patent black Black Taxi polish and The Old Vic Overglaze top coat with UV blue holographic particles. Use The Old Vic over Black Taxi nail polish for dramatic, one-of-a-kind holographic effects. EDIT: I've confirmed that the duos are identical to the Gossip Girl duos. The duos are already up on Sephora, so if you're doing Friends and Family orders, you might want to check them out! The rest are supposed to be available at Sephora this month. I need these top coats...maybe can't live without them? not good. How strange... I live in the UK and the Donmar/Wyndham/Old Vic colours seem to be exactly the same as the recent Gossip Girl collaborations Nails Inc have done, but with different names & packaging. I don't see why they felt they couldn't market nail polishes based on an American TV show to American consumers! If they are the same, I have the Wyndham one (mine is called the Blair collection) and it's gorgeous. On Sephora's site, both the Old Vic and the Wyndham collections have the same polishes listed. Because of your post, I'm even more uncertain what to buy. Heh. I just wish they sold the flakey polish by itself. I only want that one. Sophieisabelle, weird! I haven't seen those! I can tell you that I'd MUCH rather have something named after places than some teenage soap opera! Apriltini, I noticed that, I changed the item list to reflect the description on that one, since it says Black Taxi and The Old Vic UV blue sparkles. I asked the PR people about it but I haven't heard back yet. Sephora has been doing this a lot lately, listing the entirely wrong thing in the descriptions... Someone over there is sleeping on the job! Agh! In the UK these duos are named after Gossip Girl, I hate that show, it is ridiculous. I bought the duos though because I like flakey polishes. Why couldn't we get place names on ours instead? Also, why are Nails Inc selling their polish duos for £20 here and $20 in the US? That is much cheaper than what we pay and it is a British brand! That makes no sense! Stupid Nails Inc! (Sorry Scrangie, I know you don't know the answer to that one). I hope they make the fancypants topcoats available on their own - Wyndham and The Old Vic look interesting, but I don't really need their accompanying solid creme colors (and certainly not for shades I've already got, in unusually small bottles, for $10). I have the Glitterati collection already (huge surprise there) but OH MAN those flakies!! LOVE! Am I seeing flakies in those duos? The Gossip Girl duos had flakies from what I could tell. If these are flakies, then I must have them! I wish they just sold the topcoats separately... I have so many vampy cremes already! Any idea how the Donmar topcoat compares to Nubar 2010? @Jennifer When stuff is sold by the manufacturer in both countries simultaneously, the exchange rate doesn't matter; you spending £20 on something where you live is the same as us spending $20 on something where we live. If we're over here buying a deodorant for $4, it's not like you can walk into Boots and get the same thing for £2. Sohpie I noticed the same thing! I feel like they may have been more marketable as Gossip Girl polishes in the states a few years ago though. It's not nearly as popular as it once was. Still I don't see why they felt the need to change the names. I got the Wyndham one as well and it's lovely. May get the Old Vic at some point. The Donham flakie is a dupe for Nubar 2010 which I already have.